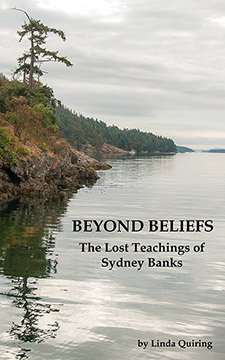 After publication of Island of Knowledge Sydney Banks and Linda Quiring began work on a second book, Beyond Beliefs. While the first book detailed Linda's experience and life changes after becoming a student of Syd's, the following years saw dramatic change on Salt Spring Island. Sydney Banks' initial and revelatory experience brought scores of young and idealistic spiritual seekers to the Island to hear Syd's teachings and become his students. As his reputation spread, mainstream people came to join what was to become a fairly large following of students. As word spread further of the amazing events taking place, psychologists and other professionals came to experience firsthand the healing effect Syd's message had on others. Banks came to believe that his message could change psychology forever. In Beyond Beliefs Syd speaks with psychologists, outlining his radical ideas about the mind and its dysfunction. Some of them are dismissive of this ordinary, uneducated Scottish man's wisdom; others are mesmerized, become ardent life-long students and carry his message into their practices. Beyond Beliefs contains the original teachings Sydney Banks shared with these mental health professionals and others. Mention the title, author and/or ISBN 978-1-77143-260-3. Barnes & Noble's Nook, Google Play, Apple's iBookstore/iTunes, Kobo Books, etc.